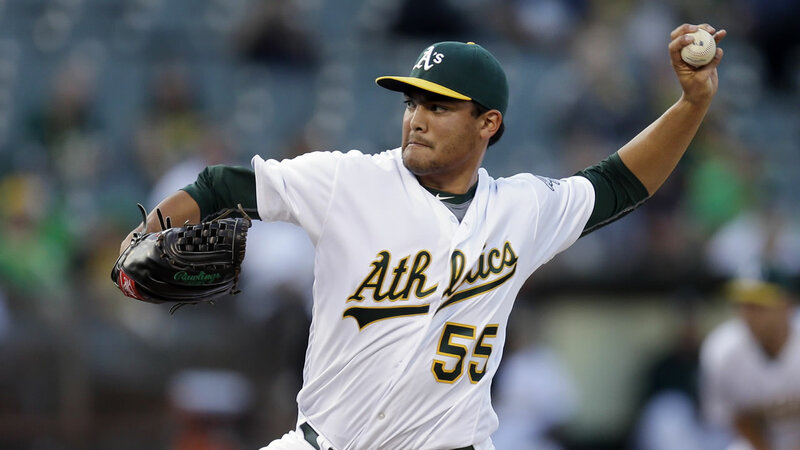 OAKLAND, Calif. -- Sean Manaea continues to feel more comfortable every time he takes the mound. He had another solid outing but the Athletics' offense was stymied and suffered yet another disappointing loss. Manaea pitched six solid innings and Jed Lowrie tripled in a run in the ninth but Oakland fell to the Detroit Tigers 4-1 on Friday night. "My slider was non-existent my first couple of games and now it's coming around," Manaea said. "The change has been huge for me and the fastball has always been there. My slider is pretty effective when I'm throwing it where I want to, and just going inside and not letting them get their hands extended." Nick Castellanos hit a home run and Cameron Maybin extended his hitting streak, giving rookie Michael Fulmer more than enough support in the Tigers win. "It was a slider I left up to Castellanos," Manaea said. "That was just lack of execution." Manaea (1-3) gave up three runs on nine hits in six-plus innings. He walked two and struck out four. The A's have lost seven of eight, though they avoided being shut out for the second time. James McCann and J.D. Martinez also drove in runs for the Tigers, who have won nine of 11 overall. Ian Kinsler was a home run shy of the cycle. Fulmer (4-1) retired 14 of the first 15 batters he faced, with a single by Khris Davis with two outs in the second inning, the only smudge of an otherwise dominating performance. "He was throwing hard, number one and he has a short little slider that's tough to pick up," A's manager Bob Melvin said. "He threw well his last time out but that was probably his best outing since he's been up." Fulmer, making his sixth career start, did not allow another baserunner until he walked Chris Coghlan in the sixth and hit Jed Lowrie with a pitch in the seventh. He did not allow a runner past first through seven innings. Coghlan singled with two outs in the eighth and Coco Crisp hit a ground rule double, chasing Fulmer. Justin Wilson came on to face pinch-hitter Billy Butler, striking him out to preserve the shutout.